You’ve spent the day panning for gold, exploring scenic rivers and getting to know sled dogs. You’re famished. In this next installment of our series on traditional and modern food in Alaska, we’re sharing with you our favorite spots to find the foods of Alaska in Fairbanks. This easy-to-find restaurant (it’s in the Westmark Fairbanks Hotel) offers Alaska cuisine like crab legs and halibut, as well as your favorite beer and wine. The work of Alaska artists will surround you as you enjoy dinner and contemplate viewing the state’s famous northern lights. The Red Lantern (also located in the Westmark Fairbanks Hotel) offers something for every traveler after a long day of sightseeing: The menu is filled with gourmet delicacies like buttermilk calamari and reindeer meatloaf as well as tasty salads and sandwiches like the pretzel ham sandwich. Choose from a list of signature beverages, including the Alaska Spiked Berry Punch. How’s that for unwinding? Located at 3360 Wolf Run, the restaurant offers a diverse menu that includes hearty steaks and sockeye salmon as well as Middle Eastern fare. Wolf Run was revitalized in 2013 after more than 50 years on the Fairbanks dining scene by local oncologist Dr. Essam Shihadeh and his wife, Lina Motawe, who studied culinary arts at the University of Alaska. Wolf Run uses produce and meat from Fairbanks-area farms, and it offers a wide range of Alaska seafood. It also features fancy desserts. Every Friday at 7 p.m. you have the chance to win one of these signature desserts, if you happen to be sitting in the lucky chair. The Alaska ambiance at Pike’s Landing is hard to beat. Enjoy the wood-burning fireplace inside the Aurora Borealis dining room, or head outside to the restaurant’s 13,000-square-foot redwood deck to enjoy a Chena River view. 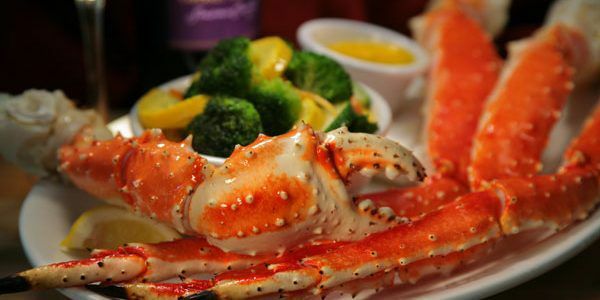 Pike’s Landing, at 4438 Airport Way, has a full menu of American fare with Alaska favorites like king crab and salmon dishes. If you’re hungry, try the Pike’s Appetizer Tower—it’s a virtual Jenga game of fried food. Another Chena River eatery, the Pumphouse offers an Alaska style buffet menu with salmon that’s delivered by float plane. It also features the “World’s Most Northern Oyster Bar.” Impress your friends by ticking this milestone off your bucket list, then head out to the patio to enjoy your new favorite Alaska microbrew. Find the Pumphouse at 796 Chena Pump Road. 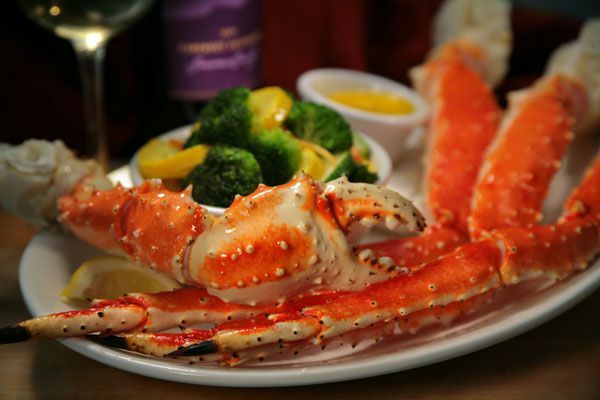 If you’re seeking a tasty and hearty Alaska menu with items like potato-crusted salmon, honey apple halibut, or wild-caught Alaska king crab legs, Lavelle’s has the cuisine for you. The bistro also features an extensive wine cellar including dessert wines and ports. It’s also the place to go if you’re looking for late-night fare: The Bistro offers a special menu of pizzas and appetizers after 10 p.m. on Fridays and Saturdays. Find it at 575 First Ave.
Named for 19th-century gambler and rapscallion Soapy Smith, the Alaska-themed restaurant is at 543 Second Ave. Filled with homesteading and mining memorabilia and local color, this is the place to get an Alaska vibe along with your crab cake sandwich. Looking for more Alaska cuisine favorites? Check with the staff at the Westmark Fairbanks Hotel and ask for their favorite local haunts. You might find a new favorite you’ll want to share with your friends (or keep to yourself).